Located at the northern tip of India, Dharamshala lies in the foothills of the Himalayas and is home to the Dalai Lama and the Tibetan government in exile. Surrounded by deodar forests (Himalayan cedar), the name “Dharamshala” literally translates to “spiritual dwelling”. Besides the city’s association with the Tibetan community, it’s renowned as one of the gateways to the beauty of the Himalayas as well as the lush tea plantations cascading down the surrounding slopes. Perched on a hillside and surrounded by Kangra tea plantations, Karma Exotica at Dharamshala makes for an ideal base camp for those keen on exploring the region’s natural and spiritual wonders. The Tsuglagkhang complex is a hands-down must-see on any trip to Dharamshala. It is the heart of the exiled Tibetan community and a renowned learning and cultural centre. It contains the Dalai Lama’s private residence, Namgyal Gompa – the largest Tibetan temple outside of Tibet as well as the Tibet Museum. People come here for the history, the much sought-after public and private sessions with the Dalai Lama, the opportunity to meditate with the monks as well as Tibetan dance and music performances. 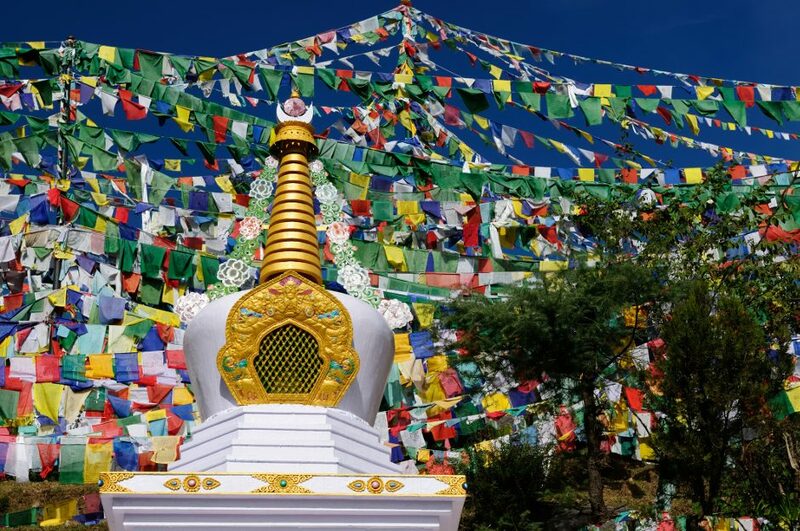 Once you’ve had your fill of Tibetan-style architecture and colourful Tibetan décor, it’s time to head outside and immerse yourself in the natural beauty of Dharamshala. Nine kilometres from the city and sitting at an altitude of over 2900 metres, Kareri Dal Lake is a pristine mountain lake fed by the melting snow. The lake is surrounded by plush green deodar forest and snow-capped mountains, which are reflected in the crystal-clear water. With an altitude of 1775 m it’s a popular base camp for trekkers heading off on expeditions into the nearby hills. Dedicated to the Hindu god Lord Shiva, Bhagsunag Temple is one of the oldest temples in Dharamshala. Hindu pilgrims, as well as foreign visitors, flock to this temple daily to take in the mesmerising beauty of its hilltop surrounds. During summer you can take a holy dip in the freshwater pool. If you wander further up the hill you will find the pristine Bhagsu Falls. The gleaming 20-metre high cascade of soft white water is a photographer’s delight.